25% of College Students Infected?? Panthers United is a campus recognized student organization, supported by the College of Agriculture and Human Sciences (CAHS). The organization’s primary focus is to exemplify leadership while impacting the lives of limited resource families through support and service to Prairie View A&M University and the local community. Panthers United has undergone several major transitions over the years. It has recently elected new leadership as well as a new advisor; a Program Specialist within the CAHS. In the past three semesters, Panthers United has accomplished many programming and service goals. Currently, the organization is in the process of planning their activities for the 2014-2015 school year. Programs of interest for next year include a reading program with Jones Elementary School and free technology classes for senior citizens. Alexandria and Gabrielle with STD Awareness Campaign. Did you know that 25% of college students in the U.S. are infected with an STD? In collaboration with Prairie View Student Nurse Association, Panthers United, hosted an information booth referred to as “Candy and Condoms” in the Memorial Student Center on March 31, 2014. 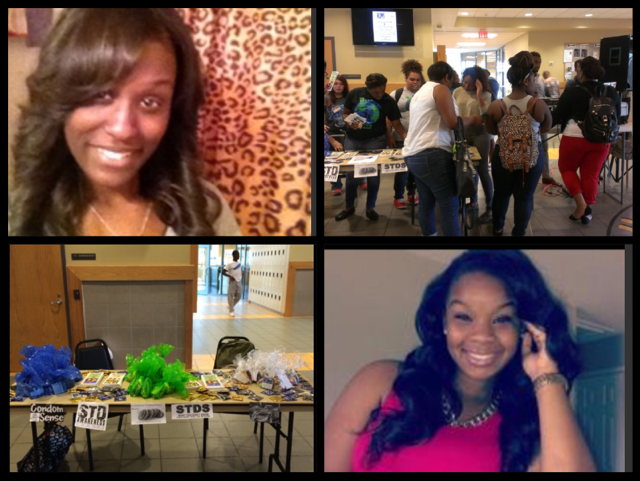 Student leaders, Gabrielle Scott, Committee Captain-Sexually Transmitted Disease (STD) Awareness, and Alexandria Hall, Vice President, successfully guided the organization so that the booth attracted over 100 individuals. The information booth provided general STD education, resources for common STDs and prevention tips to reduce transmission. Recent statistics report that in the U.S., 25% of college students are infected with an STD. Sexually transmitted diseases on campus are becoming a major problem and the issue is not getting the coverage and attention that it deserves. According to the Centers for Disease Control (CDC), the most common STD on college campuses is Chlamydia, Genital Herpes and Human Papillomavirus (HPV); when HPV does not go away, it can cause genital warts as well as cervical cancer. With nearly one in every 5 students infected with an STD on campus, it is important that student organizations, like Panthers United, to take the initiative and provide awareness and empower students to think twice before engaging in risky behaviors. Please take a moment to congratulate Panthers United for their continued efforts in supporting the CAHS vision of meeting needs and changing lives. Click here to visit Panthers United on Facebook! This entry was posted on Friday, April 4th, 2014 at 3:30 pm and is filed under 4-H & Youth Development, College of Agriculture and Human Sciences, Cooperative Extension Program, Family and Consumer Sciences, Uncategorized. You can follow any responses to this entry through the RSS 2.0 feed. You can leave a response, or trackback from your own site.